Below is a high-level overview of many of the elements of this opportunity. Full information is provided in the funding announcement that follows. The original funding announcement was amended to remove restrictions on eligibility for state colleges and universities and with more explicit instructions regarding the submission of budgets. The purpose of this announcement is to solicit applications for projects that equip law enforcement officers at risk of shootings with rifle-resistant body armor. 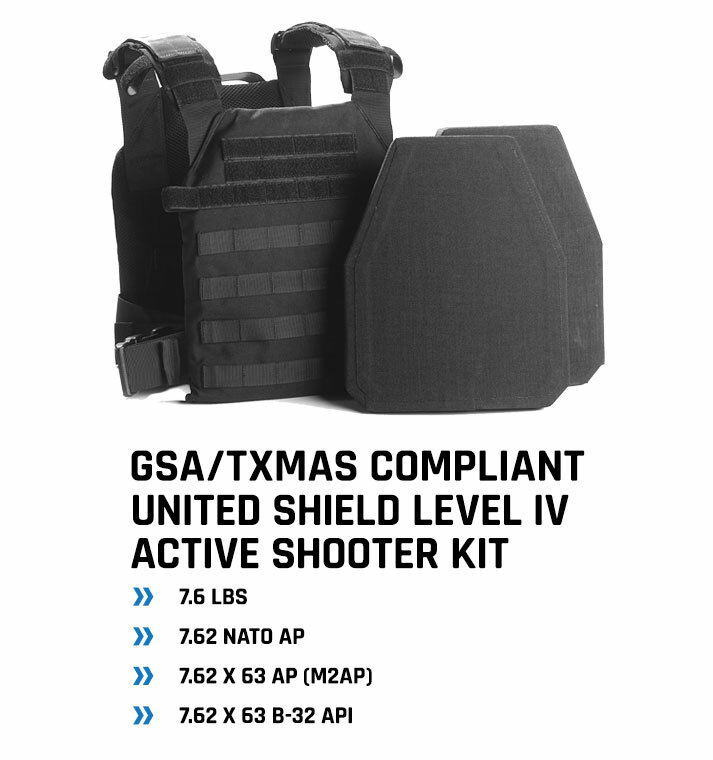 Funds may be used by law enforcement agencies to equip law enforcement officers with bullet-resistant personal body armor compliant with the National Institute of Justice (NIJ) standard for rifle protection. It is anticipated that up to $25 million may be funded under this announcement. Applicants will respond to this funding announcement by completing an application in eGrants https://eGrants.gov.texas.gov. There is no minimum or maximum request under this program, however, applicants should consider the overall availability of funds and CJD’s goal to provide resources to as many departments as possible. Funds may only be used to obtain body armor, including bulletproof vests, ballistic plates, and plate carriers. There is no match requirement under this program. All projects must begin between Jan. 1 and Mar. 1, 2018. A project period may not exceed 12 months. Applications may be submitted by the Texas Department of Public Safety, and units of local government and educational institutions that operate law enforcement agencies employing peace officers under Article 2.12, Texas Code of Criminal Procedure, including municipalities, counties, independent school districts, universities, public and private colleges and universities, federally recognized Native American tribes, community colleges and hospital districts. With the exception of the Texas Department of Public Safety, applications must be submitted by the entity operating the law enforcement agency, not the agency itself, e.g. the county government, not the sheriff’s office. If additional information is needed, contact the eGrants help desk at eGrants@gov.texas.gov or (512) 463-1919. Instant protection for high-threat, active shooter situations. 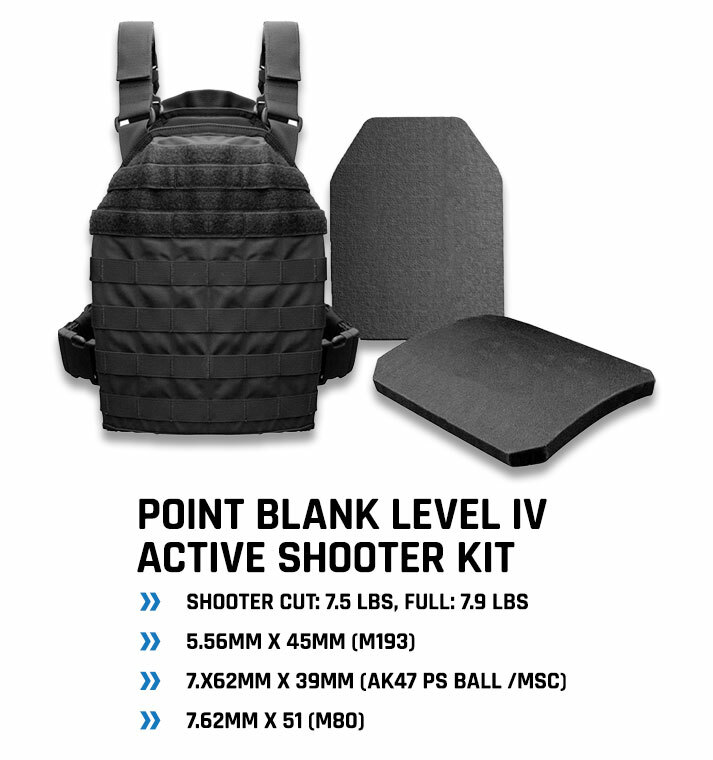 Point Blank’s Level IV Active Shooter Kit includes two 10" x 12" stand-alone rifle plates and a tactical plate carrier. Wear it alone or over concealable armor for increased protection. Instant protection for high-threat, active shooter situations. 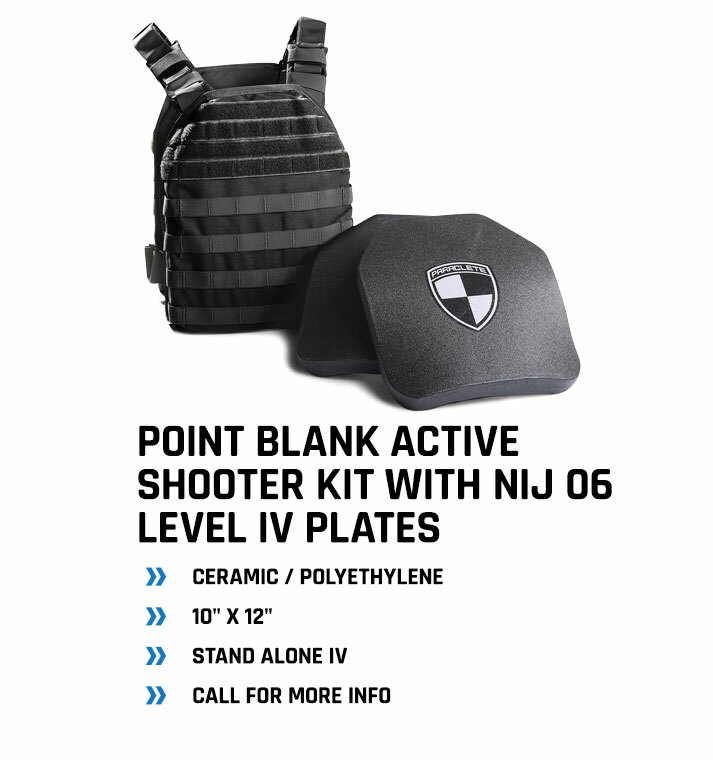 Point Blank’s Active Shooter Steel Plate Kit includes two 10" x12" stand-alone rifle plates and a tactical plate carrier. Wear it alone or over concealable armor for increased protection. This plate carrier is easily donned over your uniform or off-duty shirt. Side and shoulder straps are adjustable for a more secure and customized fit, with four buckles to accelerate on/off. Constructed from heavy-duty nylon, the MOLLE plate carrier will serve you well for years to come. This kit could be a potentially lifesaving piece of equipment, with a shooter's cut design for an effective shooter's stance. Leave it in your car and you will always have armor available for responding to an emergency situation. Instant protection for high-threat, active shooter situations. 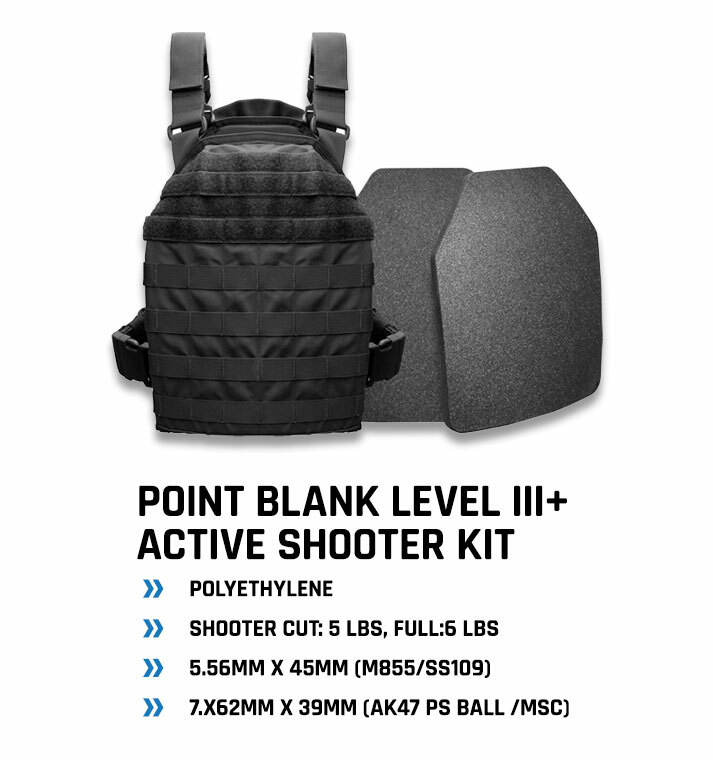 Point Blank’s Level III Active Shooter Kit includes two 10" x 12" stand-alone rifle plates and a tactical plate carrier. Wear it alone or over concealable armor for increased protection. 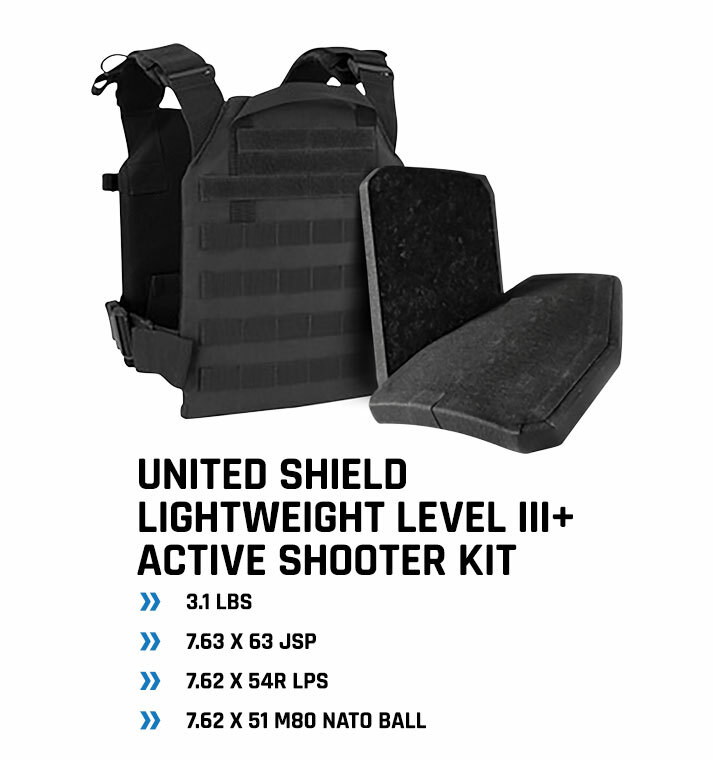 Perfect for rapid response to active shooter scenarios, this Lightweight Level III+ Active Shooter package from United Shield includes two Delta + 6H NIJ 0101.06 certified Stand Alone Ballistic Plates and a RPSS (Rifle Plate Suspension System) Carrier with Police Placard. This package immediately provides responders with maximum protection, above and beyond the standard level of protection offered by the standard-issue soft body armor. Constructed from polyethylene, the Level III+ Delta + 6H plates measure 10" x 12" and weigh 3.1 lbs. each. Ergonomically designed to offer the user NIJ 0101.06 certified stand-alone protection from the following threats. The RPSS carrier gives the end user the ability to have a one size fits all vest, with MOLLE compatibility for easy attachment of additional gear. Perfect for rapid response to active shooter scenarios, this Level III+ Active Shooter package from United Shield includes two Sigma 6H NIJ 0101.06 certified Stand Alone Ballistic Plates and a RPSS (Rifle Plate Suspension System) Carrier with Police Placard. 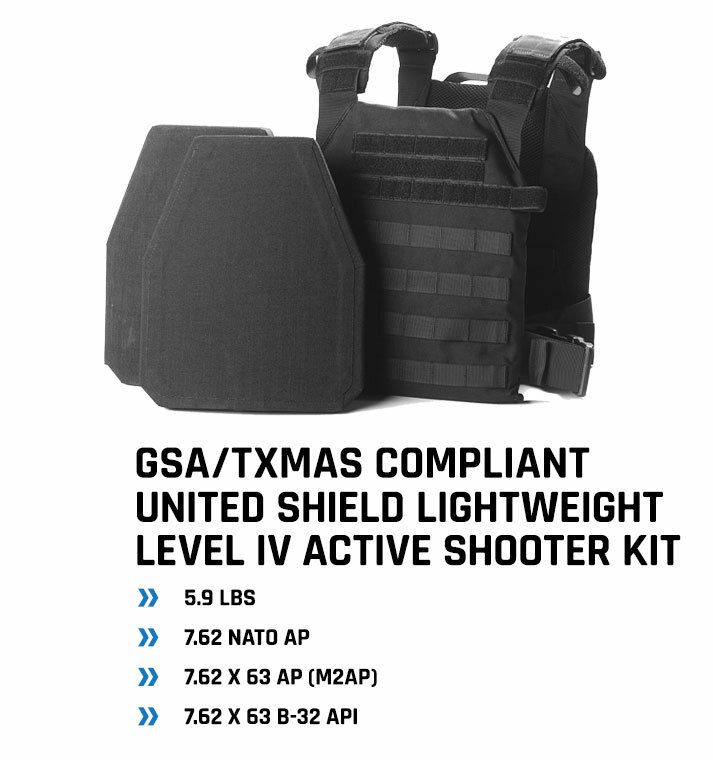 This package immediately provides responders with maximum protection, above and beyond thestandard level of protection offered by the standard-issue soft body armor. Featuring polyethylene construction, the Level III+ Sigma 6H plates measure 10" x 12" and weigh 5.8 lbs.each. Ergonomically designed to offer the user NIJ 0101.06 certified stand-alone protection from the following threats. 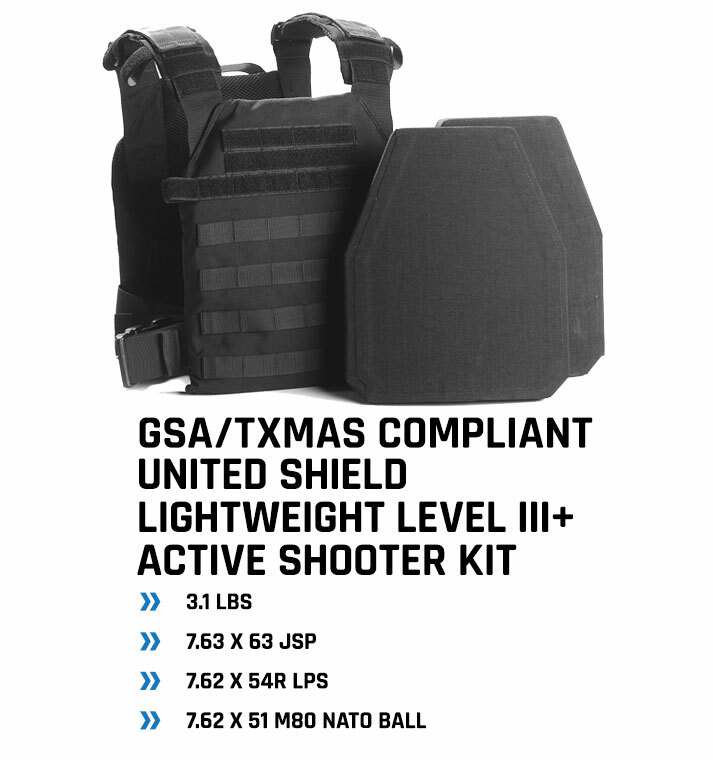 Perfect for rapid response to active shooter scenarios, this Lightweight Level IV Active Shooter package from United Shield includes two Zeta Lite 6H NIJ 0101.06 certified Stand Alone Ballistic Plates and a RPSS (Rifle Plate Suspension System) Carrier with Police Placard. 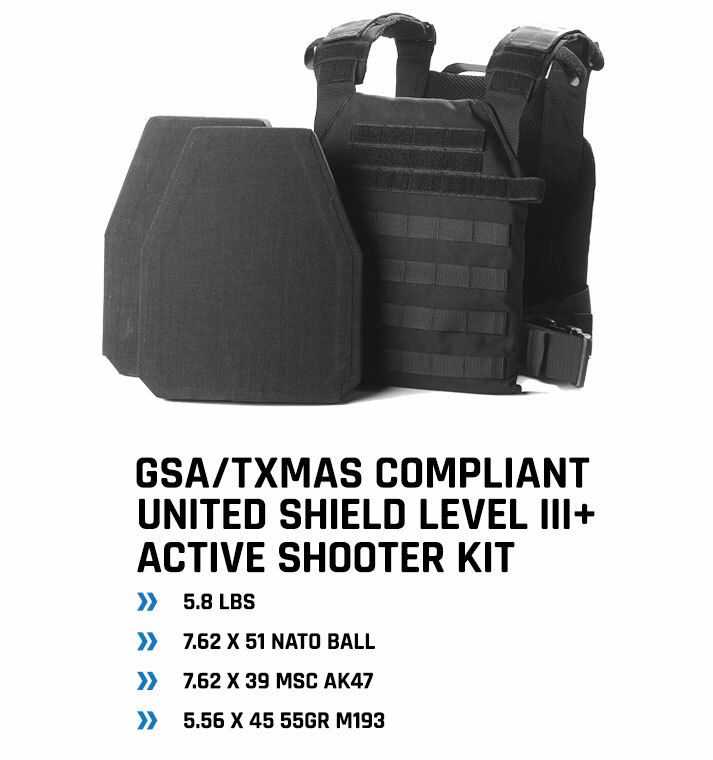 This package immediately provides responders with maximum protection, above and beyond the standard level of protection offered by the standard-issue soft body armor. Constructed from ceramic and polyethylene, the Level IV Zeta Lite 6H plates measure 10" x 12" and weigh 5.9 lbs. each. Ergonomically designed to offer the user NIJ 0101.06 certified stand-alone protection from the following threats. Perfect for rapid response to active shooter scenarios, this Level IV Active Shooter package from United Shield includes two Zeta 6H NIJ 0101.06 certified Stand Alone Ballistic Plates and a RPSS (Rifle Plate Suspension System) Carrier with Police Placard. 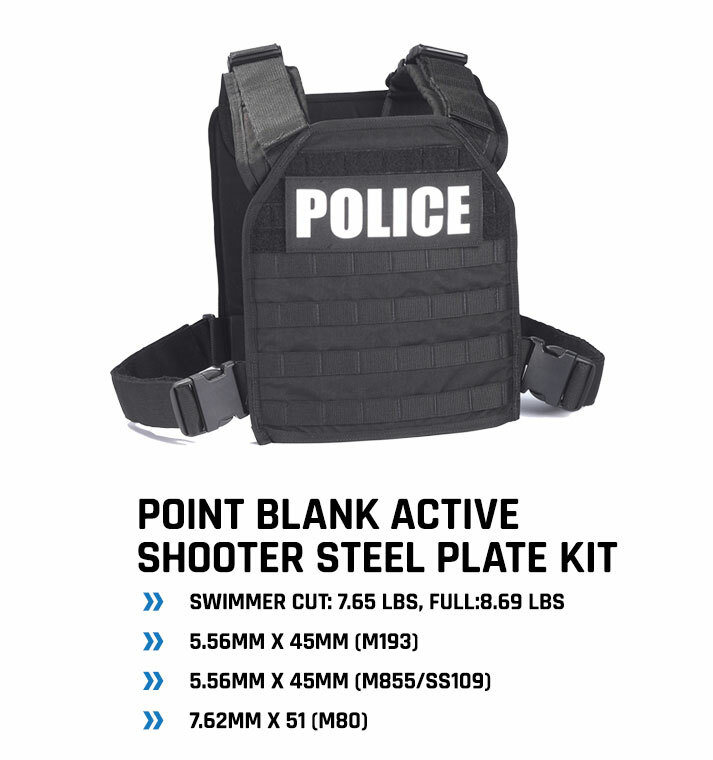 This package immediately provides responders with maximum protection, above and beyond the standard level of protection offered by the standard-issue soft body armor. Constructed from ceramic, the Level IV Zeta 6H plates measure 10" x 12" and weigh 7.6 lbs. each. Ergonomically designed to offer the user NIJ 0101.06 certified stand-alone protection from the following threats. 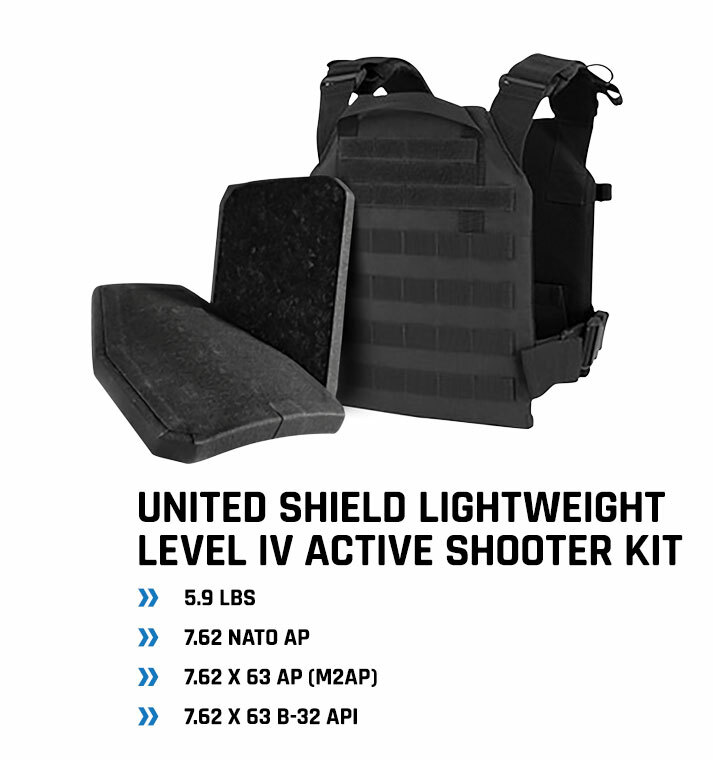 Perfect for rapid response to active shooter scenarios, this Level III+ Active Shooter package from United Shield includes two Sigma 6H NIJ 0101.06 certified Stand Alone Ballistic Plates and a RPSS (Rifle Plate Suspension System) Carrier with Police Placard. This package immediately provides responders with maximum protection, above andbeyond thestandard level of protection offered by the standard-issue soft body armor. Featuring polyethylene construction, the Level III+ Sigma 6H plates measure 10" x 12" and weigh 5.8 lbs. each. Ergonomically designed to offer the user NIJ 0101.06 certified stand-alone protection from the following threats.